(CNN) -- Mainland China reported its first case of swine flu -- a 30-year-old man "currently enrolled in a university in the United States," the country's ministry of health said. 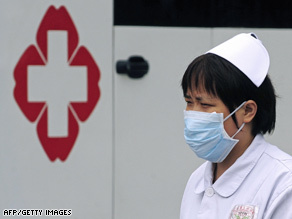 A nurse wears a mask Monday at a hospital in the Chinese city of Chengdu. The number of swine flu cases worldwide jumped over the weekend by more than 1,000, to 4,694 from 3,440 in 30 countries and territories, the World Health Organization said Monday, with 53 deaths from the sickness. The Chinese patient, identified only by his surname Bao, flew from the United States to Japan on Thursday and from there to the Chinese city of Chengdu via Beijing, the ministry said on its Web site. During the flight from the capital to Chengdu, he became feverish "accompanied with throat pain, coughing, stuffy nose and slight running nose," the ministry said. He was hospitalized for "isolation and treatment," and his temperature returned to normal, the ministry said. It confirmed Saturday that he had been suffering from the H1N1 virus, as the disease is officially known. Most other passengers who were on Bao's flight from Beijing to Chengdu have been located -- in 21 different provinces -- and sent for medical observation, the ministry said. China has asked that people contact the country's Centers for Disease Control if they flew with Bao either to Beijing or Chengdu, which is in Sichuan province. China's first case of swine flu came last week in Hong Kong, a region that has a special legal status and that the WHO lists as a separate country in its H1N1 statistics. The vast majority of deaths from swine flu have been in Mexico. To date 48 people have died there. Three have died in the United States, and one each in Canada and Costa Rica. In the United States, the number of confirmed cases jumped to 2,532 from 1,639 on Saturday, the Centers for Disease Control and Prevention said Monday. Swine flu cases have been reported in 43 U.S. states and the District of Columbia.